Get ready to travel through 10 dynamic environments, each carefully created and intricately designed, as you battle through more than 100 action-packed levels. There are also 11 special levels guarded by challenging bosses that you must defeat in order to advance in the game. For those who prefer to enjoy the sights and sounds of the game at a leisurely pace, there are 100 levels in the relax mode, each with a uniquely cute and stylish brick pattern to keep you occupied for hours on end. GeBall was available as a giveaway on January 4, 2008! If you are into the classic breakout and arkanoid style arcade games, then you are in luck. 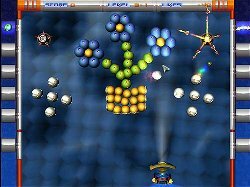 GeBall is everything you know and love about arkanoid, but packed with more action, better graphics, and heart-thumping sounds. Prepare yourself for 10 energetic and explosive environments, full of dazzling lighting effects, dynamic special effects integrated with outstanding 3D modeling and realistic physics. Be blown away by the awesome sound effects and exceptional background music. And we haven’t even talked about the game play yet! 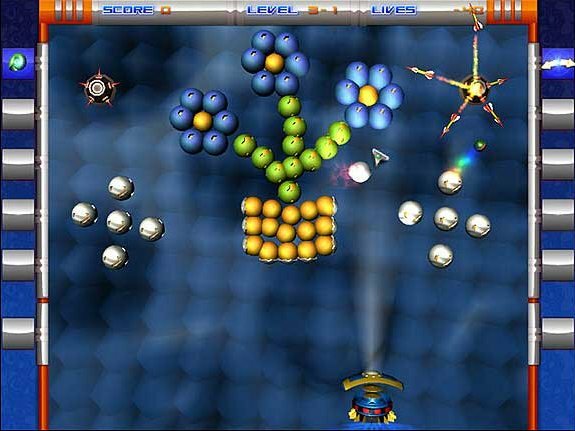 There are over 80 fast and furious levels spread out in 10 different stages for you to power your ship through, and the game is enhanced by a multitude of special modifiers that invert the mouse scrolling axis, flip the horizontal and vertical axes, changes the environmental effects, so no two games will ever be the same. You can also collect coins to upgrade your ship with special powers, which will come in handy when you have to face bosses that stand between you and your path to the next stage. For those who like to take it at a slower pace, there are also 100 different levels in the relax mode of the game, that offers a slight variation on game play, but still allows players to experiences all the bells and whistles of the standard game mode. #56. "Why don’t you go make a game yourself? I bet that you can’t." That's correct, I can't. I'm also not complaining about the type of games being given away. I don't look a gift horse in the mouth. I'm grateful for this website, it's saved me lots of money. I just want the constant complainers to go do something productive, i.e. submit ideas to game makers, etc...instead of putting a line or two of text here saying there's too much this or that lately. #56. "Why don’t you go make a game yourself? I bet that you can’t." That's correct, I can't. I'm also not complaining about the type of games being given away. I don't look a gift horse in the mouth. I'm grateful for this website, it's saved me lots of money. I just want the constant complainers to go do something productive, i.e. submit ideas to game makers, etc...instead of putting a line or two of text here saying there's too much this or that lately. I'm a breakout lover so was pleased to see another variation and duly downloaded Geball............only to get an hour's worth of play! However, having said that I didn't need an hour to decide I didn't like it. The idea is great, but some of the explosions hid the ball from sight for way too long and, even after adjustments, mouse control was too slow. Sorry, but this is definitely a thumbs down for from me. #79, Which OS do you use and what conf? Here it did not crash after hours of game play. #81, Are you using windows server family of products? Some applications crash with similar messages on Windows Server 2003. It may not support server OS-es. #79, Which OS do you use and what conf? Here it did not crash after hours of game play. #81, Are you using windows server family of products? Some applications crash with similar messages on Windows Server 2003. It may not support server OS-es. Loaded fine on vista32 home and played fine no probs. Nice variation with a high skill level that is good for the reflexes. Loaded fine on vista32 home and played fine no probs. Nice variation with a high skill level that is good for the reflexes. Thanks! Nice game. I downloaded and installed and entered the name and key. Then it comes up with -- Cannot find import;DLL may be missing, corrupt, or wrong version File "d3dx9_35.dll", error 126. I uninstalled and reinstalled and same thing. Any clues? This Game is really strange. The Graphics is to much nervous than to have fun with it. The sound effects are scary too. There is no real arkanoid feeling. So I deleted the game, and this do I not very often. This Game is really strange. The Graphics is to much nervous than to have fun with it. The sound effects are scary too. There is no real arkanoid feeling. So I deleted the game, and this do I not very often. First impressions of this were very good, despite being told I needed a password when I tried to run it (have no idea what that password was supposed to be but it started without it). It's a very polished game and shows some serious promise for any future sequels - good polished (albeit slightly samey) graphics, good sound and fairly good gameplay. Having said that it's not quite the finished article IMO. The ball physics can be a little quirky with some of the angles it decides to bounce off at. Add to that the dark overall look of the game and dark coloured ball adds an unnecessary element of frustration. The bat responsiveness could be improved and having the mouse cursor permanently visible can be distracting. Also the game crashed twice in 15 minutes for me. So this one is not for me but I will certainly keep an eye out for GeBall 2 because if they can iron out some of the niggles it could be one of the best breakout games around. First impressions of this were very good, despite being told I needed a password when I tried to run it (have no idea what that password was supposed to be but it started without it). It's a very polished game and shows some serious promise for any future sequels - good polished (albeit slightly samey) graphics, good sound and fairly good gameplay. Having said that it's not quite the finished article IMO. The ball physics can be a little quirky with some of the angles it decides to bounce off at. Add to that the dark overall look of the game and dark coloured ball adds an unnecessary element of frustration. The bat responsiveness could be improved and having the mouse cursor permanently visible can be distracting. Also the game crashed twice in 15 minutes for me. So this one is not for me but I will certainly keep an eye out for GeBall 2 because if they can iron out some of the niggles it could be one of the best breakout games around. I have Windows Vista via HP and Compaq and was suprised this dowloaded, setup and I was able to play immediately totally problem free! A real rarity indeed in those steps, as for the graphics fairly cool and a definite different twist on the usual brick busting game. I played it about half of the time alloted and was fairly amused. I downloaded it and it would not work with my Vista. I subsequently tried to uninstall and reinstall using the default location as #36 described, but still no luck. I seem to have a lot of problems with Vista and the games that I can get off here. But thanks for the journey. I downloaded it and it would not work with my Vista. I subsequently tried to uninstall and reinstall using the default location as #36 described, but still no luck. I seem to have a lot of problems with Vista and the games that I can get off here. But thanks for the journey. I had a lot of problems running this program. I got the keys and registrations, but I came to find out that the game runs only from the desktop shortcut. You can make a new shortcut directly from the executable and put it in the menu and it works OK.
My questions is, Why are we given registration names and numbers? I was never asked for one, never saw a screen that says anything about 60 seconds. I am afraid the program is not completely installed and tomorrow it wont work. Bleh. Creating a game with tons of shiny, flashing, spinning things doesn't make it fun. Avoid this one. #73, Try running the game by running exe file directly from install folder, not by using shortcut. On some systems thats problem, as you can see in other posts. Meh, declares missing DLL at startup. Tried reinstall, still same problem. Nah! Not for me. The constantly moving exploding obstacles that kept appearing didn't seem to serve the game other than to annoy me. I played for a while with no apparent problems but just didn't enjoy waiting so long for those last few items off the screen. I got ***VERY*** bored, especially during levels when the game moves the bricks around randomly so aiming is fruitless. That said. The game has some new concepts for this genre though - choosing and buying the power ups like buying guns and ammo for a space shooting game. The darkness factor was very cool! Kudos to the developers. Thanks for the opportunity to try it GGotD and SheepArcade. Nah! Not for me. The constantly moving exploding obstacles that kept appearing didn't seem to serve the game other than to annoy me. I played for a while with no apparent problems but just didn't enjoy waiting so long for those last few items off the screen. I got ***VERY*** bored, especially during levels when the game moves the bricks around randomly so aiming is fruitless. That said. The game has some new concepts for this genre though - choosing and buying the power ups like buying guns and ammo for a space shooting game. The darkness factor was very cool! Kudos to the developers. Thanks for the opportunity to try it GGotD and SheepArcade. #63 FM, thanks for you help. After all that though I played it for a few levels and then uninstalled it. 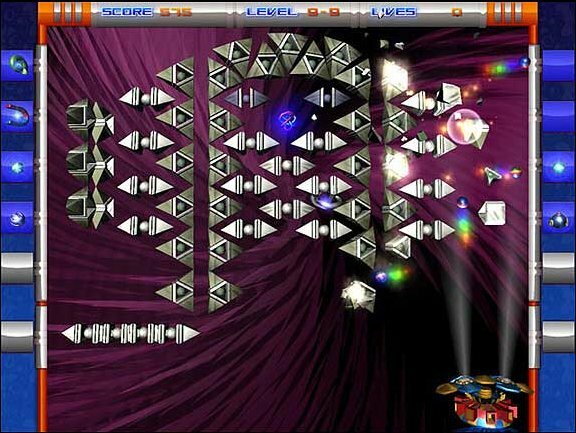 Although Arkanoid type games are the only ones I play aside from FPS games I didn't like GeBall. It has some nice ideas but didn't seem to pull it off. Thanks anyway though GAOTD! Thats the whole point od this mode. Ball is moving in one plane and bricks in 3D, and its obviously intention of developers, not a bug. You have guided rockets to destroy these. Before that you destroy as much as you can with laser and balls. When there is some of the bricks left you use guided rockets. That strategy worked for me. To #51. &gt;Mmm, Installed ok but I can only get it working in Relaxed Mode and &gt;in this mode the ball disapprears behind the objects being hit (making gameplay almost impossible) Thats the whole point od this mode. Ball is moving in one plane and bricks in 3D, and its obviously intention of developers, not a bug. You have guided rockets to destroy these. Before that you destroy as much as you can with laser and balls. When there is some of the bricks left you use guided rockets. That strategy worked for me. I always fast track through the install setup after doing a virus check (two checkers) and missed the reg name and key due to fast mouse clicking on my part. The successfully activated window with the add to ie favourites window also contains the REG name and number as follows. Enjoy ... You can never have too many Arkanoid games can you? I always fast track through the install setup after doing a virus check (two checkers) and missed the reg name and key due to fast mouse clicking on my part. The successfully activated window with the add to ie favourites window also contains the REG name and number as follows. Register your copy using following data: Registration name: GiveAwayOfTheDay Registration key: AstringofnumbersandlettershereistheKey So the game is Registered but to GAOTD =/ Enjoy ... You can never have too many Arkanoid games can you? This game is really like two games in one...if you don't like one style of play, be sure and give the other style a try before uninstalling. I managed to get everything loaded and running. However, be careful with switching from 3D to 2D mode, gang. It caused my installation to have a segmentation error and killed the game. Reinstall cured that (as long as I run it in 3D mode, anyway). This is such a cool game! My 7 year old son loves these "break out" games and I can't wait until he sees this one. As a parent, I love that you earn "money" to buy power-ups instead of them just being handed to you. Very similar to the real-life lesson I am trying to impart now! Thanks so much for this game and all the other ones that are offered. Please don't let a few ungrateful people ruin it for the many, many of us who appreciate these games and look forward to seeing what's coming each day. I would think more people appreciate your efforts than don't! I love breakout games. This is a nice game. The installation was not too easy for me. The first install gave me the usual user name and password popup box. When I started the game it closed due to an error. After an uninstall and reinstall the game started. I got the same popup box for user name and password. But the game started without needing this info. I'm not too sure about this publisher. I have seen them before and always passed on them. I thought that this publisher being here on GGAOTD meant they were safe. I'm still not sure. Either way I thank you guys at GGAOTD for your efforts in giving us some great games. I thank the publisher Sheeparcade too. And just a couple of tips that work everytime for me. Always read the Readme.txt file to know how to properly Activate the software BEFORE running the install programs or the programs themselves. With the following changes of course. Some of the most common activation problems can be helped by doing the following. 1. Those GAOTD programs and games that come with two .exe files, "Activate.exe" and "Setup.exe". It is always better to run the "Setup.exe" file first, then uncheck "Run Installed Program Now" or "Launch Installed Program Now" at the end of that setup. Now run the "Activate.exe" to activate properly. It will let you know if it was activated. Now you can you run your GAOTD program and it should be activated. 2. Those GAOTD programs and games that have just the one "Setup.exe", such as this game, always run the "Setup.exe" and then uncheck "Run Installed Program Now" or "Launch Installed Program Now" at the end of the GAOTD installer setup. This is when GAOTD usually will give you a popup with any Registration info that you have to enter. This is usually missed and lost if you run the GAOTD program right after installing. Now you can copy and paste all registration info. (I usually save to notepad first in case I close the popup). Sometimes you have to scroll to get all the key information. Sometimes GAOTD will do this automatically and will let you know it was sucessfully activated. Now you can run and register your GAOTD program. 3. Those GAOTD programs and games that have just the one "Setup.exe", and a .Reg file, always run the "Setup.exe" and then uncheck "Run Installed Program Now" or "Launch Installed Program Now" at the end of the software installer setup. And considering any info in the "Readme.txt" file, then run the .Reg file and the registration info will be added to the Registry. That is how MOST .reg files are used. Now you can run your GAOTD program. Also, most programs will have a tab somewhere in the program that says "Help", is a "? ", or has an "About" tab. After activating your program, you can usually go to one of those tabs and you can see if the software is "Registered" or not. Sometimes it will even say on the splash screen when you first start the installed program. It all depends on the program. Hope this helps future installs and activations. First Off, Great Game!!! Thanks GGAOTD And just a couple of tips that work everytime for me. Always read the Readme.txt file to know how to properly Activate the software BEFORE running the install programs or the programs themselves. With the following changes of course. Some of the most common activation problems can be helped by doing the following. 1. Those GAOTD programs and games that come with two .exe files, "Activate.exe" and "Setup.exe". It is always better to run the "Setup.exe" file first, then uncheck "Run Installed Program Now" or "Launch Installed Program Now" at the end of that setup. Now run the "Activate.exe" to activate properly. It will let you know if it was activated. Now you can you run your GAOTD program and it should be activated. 2. Those GAOTD programs and games that have just the one "Setup.exe", such as this game, always run the "Setup.exe" and then uncheck "Run Installed Program Now" or "Launch Installed Program Now" at the end of the GAOTD installer setup. This is when GAOTD usually will give you a popup with any Registration info that you have to enter. This is usually missed and lost if you run the GAOTD program right after installing. Now you can copy and paste all registration info. (I usually save to notepad first in case I close the popup). Sometimes you have to scroll to get all the key information. Sometimes GAOTD will do this automatically and will let you know it was sucessfully activated. Now you can run and register your GAOTD program. 3. Those GAOTD programs and games that have just the one "Setup.exe", and a .Reg file, always run the "Setup.exe" and then uncheck "Run Installed Program Now" or "Launch Installed Program Now" at the end of the software installer setup. And considering any info in the "Readme.txt" file, then run the .Reg file and the registration info will be added to the Registry. That is how MOST .reg files are used. Now you can run your GAOTD program. Also, most programs will have a tab somewhere in the program that says "Help", is a "? ", or has an "About" tab. After activating your program, you can usually go to one of those tabs and you can see if the software is "Registered" or not. Sometimes it will even say on the splash screen when you first start the installed program. It all depends on the program. Hope this helps future installs and activations. After being thoroughly entertained by the quality graphics and general creativity of Alawar's Hyperballoid, I was hoping for a repeat treat with Sheepherders' GeBall. Unfortunately, either I'm hitting the old age glass ceiling or developers are butting heads with a limit on the amount of animation+music+colorful special effects that can be squeezed into a game and still call it fun. The game d/l'd okay (all 32 megs), registration was smooth, and while the requirement of 116 megs of free space caught me off guard, it didn't faze my PC. However, unlike Hyperballoid, the GeBall screen is so bloody chaotic that even in Relaxed mode, I was wincing and squinting trying to even see the little balls. (and I don't mean chaotic in an enjoyably challenging way, but in a flying through a meteor swarm while trying to put out a grease fire and juggle half a dozen African Killer bee nests sort of way) Uh oh, I fear I've just raised the bar for game developers another notch. Someone earlier asked how to use the powerups, and all you have to do is just use the mouse cursor, then click on the appropriate box on either the left or the right side of the screen. I like to play relaxed mode, but this one was a little overly relaxed. I got down to 10 targets, which were hit a number of times from all directions, but did not go away. After 3 minutes of those 10 targets, I gave up. It did not make sense to me. I wanted to get off of level 1 and could not. I like to play relaxed mode, but this one was a little overly relaxed. I got down to 10 targets, which were hit a number of times from all directions, but did not go away. After 3 minutes of those 10 targets, I gave up. It did not make sense to me. I wanted to get off of level 1 and could not. Wood like to see this site have what the Gaotd site has, a drop down Menu of G.GAOTD English, G.GAOTD Spanish, extra. Hello Game Give Away of the Day (G.GAOTD) and Give Away of the Day (GAOTD). a sojestion on this pages when you are at the bottom of page needs a Link back up to the TOP of Page and /or a link like the ones you use for yesterdays (past comments) that go's like: View all comments » Wood like to see this site have what the Gaotd site has, a drop down Menu of G.GAOTD English, G.GAOTD Spanish, extra. "Why don’t you create a game instead of complaining about it, if it bothers you so much?" That's a stupid argument. If a reviewer doesn't like a movie, it's not his job to make one that he will like. If I don't like the way that my book binding keeps seperating, it's not my job to start a publishing company. If somebody doesn't like getting a bunch of match-3s and Breakouts, it's not their job to make a shooter or strategy game. Why don't you go make a game yourself? I bet that you can't. The majority of the people on this site can't. Don't tell them to. &gt;harryparaballs "Why don’t you create a game instead of complaining about it, if it bothers you so much?" That's a stupid argument. If a reviewer doesn't like a movie, it's not his job to make one that he will like. If I don't like the way that my book binding keeps seperating, it's not my job to start a publishing company. If somebody doesn't like getting a bunch of match-3s and Breakouts, it's not their job to make a shooter or strategy game. Why don't you go make a game yourself? I bet that you can't. The majority of the people on this site can't. Don't tell them to. For those who have problems with the mouse being sluggish, watch the main mouse cursor (not the "paddle"). As I play these games, my mouse itself tends to migrate higher. If it gets too high, the action becomes erratic. Just move the mouse back down so the cursor is at the level of the paddle and you're fine. The only reason it needs to know the 'y' value is for when you select one of your "power-ups" from the side menus. Sorry for the overposts I think I was having a problem with my computer. Thanks for your wonderful compliment. Glad you enjoy my witty sense of humor. I also thought I could only get the game working in relaxed mode. When you click on New Game it appears as if nothing is happening. You have to click on I believe it’s the red or green tiny ball and that starts the first board of the game. Now I’m off to my next cigarette and a cup of coffee and then I’m off to my favorite website http://www.freestufftimes.com Gotta go and get my free samples for the next day. If you want a website where the people are sooooo warm, friendly, appreciative, and never complain then you have to go to http://www.freestufftimes.com I met the nicest people there. Don’t get me wrong there are awwwesome people here as well minus the unappreciative ones. Marilyn T #43. Sometimes when you copy and paste, you can have a space at the beginning or end of the code and not notice it, check for that. Also double check and make sure you have copied all the code. If you get a little gray prompt box asking for a password, ignore it and start the game anyway. That box will not return after playing the game once. Marilyn T #43. Sometimes when you copy and paste, you can have a space at the beginning or end of the code and not notice it, check for that. Also double check and make sure you have copied all the code. If you get a little gray prompt box asking for a password, ignore it and start the game anyway. That box will not return after playing the game once. I prefer Alawar games, This one is really lame and buggy. Some of you people complain about too many arkanoid/breakout type games being given away or too many platform games, whatever type of game there will be no end of complaints. Why don't you create a game instead of complaining about it, if it bothers you so much? I for one am grateful for this website and for what it's trying to do. Where are the Keys for this program? 60 minutes of play issue; resolved. Thanks GGOTD and SheepArcade for a really unique take on an arkanoid type game. It's really different. That's all I'm bothering to say, since my last 3 comments haven't been posted....don't really understand, since I usually only post if I have something positive to say about a game, and wait for something I'm interested in if the days' game isn't my cup of tea. What up with that? As has been said, Explosions get in the way, after missing the ball in the first bonus round I press ESC to quit the game, and guess what, it crashes anyway. I'm uninstalling it now. 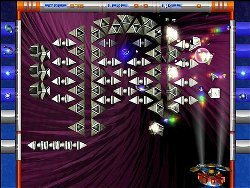 THis Game is One of the Better arkanoid games ....I am a fan of these types, I see one problem I have and that is when in window mode You have to make sure your curser arrow stays in the game area or the ship will freeze, and another is when You loss You have to go back to the beginning , instead of just going back to the last level. I think you should be able to go back to the Last level you completed. It is different as you buy your power ups instead of catching them. the game play is fun the Music is not bad, the graphics are good. Plays well on my Vista Home ed. all In all I have to say this one would be worth the 20 dollars. Thank You GOTD for the Games and software. I really look forward to the comments here as to how a game is played, white rabbit your awesome on your reviews. When someone complains it is not helpful unless you say why. Rabbit's great instructions I copied and pasted the activation code. I got an activated notice from GGOTD but the game itself kept saying that it was in incorrect number and I only got the limited game play. I just uninstalled the game & would like to try again. Any suggestions? Help !! I installed the program as I usually do and following White Rabbit's great instructions I copied and pasted the activation code. I got an activated notice from GGOTD but the game itself kept saying that it was in incorrect number and I only got the limited game play. I just uninstalled the game &amp; would like to try again. Any suggestions? #13: It says I only have 60 minutes of play, new to this webpage, great job guys. can anyone help me. I love these type of games although it could be I had a to much sugar in my breakfast i m goin to download it right away thanks ggotd!!!! I got the same message with password and then the crash. As Diane wrote after an new install it works fine. The game is technically not up-to-date but there are some really cool ideas behind it. There is much movement in this game and on the difficulty setting "expert" it is quite challenging. The ball speed is not very high but you have to fight against many bad power ups falling down. There are some power ups which are not to be seen very often in arkanoid games anymore - like the reverse powerup that...well...reverses the steering of the pad or the "light off" powerup which...yeah...switches off the light on the play field. The sound is not very well made, in my opinion. While the music is very nice the effects are low quality - especially the voice commenting powerups and level completion. All in one a nice game. I wouldn´t buy it but for playing it a little while it is okay. I got the same message with password and then the crash. As Diane wrote after an new install it works fine. The game is technically not up-to-date but there are some really cool ideas behind it. There is much movement in this game and on the difficulty setting "expert" it is quite challenging. The ball speed is not very high but you have to fight against many bad power ups falling down. There are some power ups which are not to be seen very often in arkanoid games anymore - like the reverse powerup that...well...reverses the steering of the pad or the "light off" powerup which...yeah...switches off the light on the play field. The level bosses at the end of every stage is a nice idea I wanted to see in that kind of games for a long time. But on "expert"-difficulty they are very hard to defeat because of the many death-"powerups" they release. I´ll try to play on "normal" next time ;) The sound is not very well made, in my opinion. While the music is very nice the effects are low quality - especially the voice commenting powerups and level completion. All in one a nice game. I wouldn´t buy it but for playing it a little while it is okay. Addictive ....addictive! After running into a few minor glitches getting the program to load and run I started on "relaxed" mode without instructions(Or warning I should say). I must admit, at first I hated it, everything was exploding and I had the devil of a time even seeing where the ball was going. When I got down to the last couple of bricks,it took forever to get rid of them. ARRGgggg! But I was determined to make it through that first level. Eight levels later I came up for air!! It was one of those,just one more level deals:)) By then I had figured out that on relaxed mode you have unlimited lives and to get through a level you had to use strategy. Use the bullets first to clear the lower blocks and the guided missiles to clear out the stragglers at the end, because even though you can use the paddle to hit the ball to where the blocks are, if they aren't turned right it won't connect. Save a few missles back for the end or it will take forever to finish the level. I then checked out the regular Arcade mode and the options menu. The development team seems to have tried to think of everything. It has windowed mode, but the game functioned poorly on this mode for me, perhaps with tweaking it would work better. Full screened, the options I chose worked fine. Laura #20, I don't know if this would help you, but you can turn off the movement of the background screen. This game is like a shooter-breakout-carnival ride, it does leave you a little dizzy, but in a fun way. The coins you collect actually have a purpose, you use them to purchase bonus items to be used in the next level. Even with the glitches(I started out with -4 lives on the first level, lost one ball and lost the game)I really like this game. The music changes often enough it doesn't get too annoying, the sound effects are pretty good... the one voice that says "Play ball" sounds rather demanding, but I got used to 'pushy guy' and didn't mind him after awhile. I really don't know what would make this game better other than fix the glitches and throw in some cotton candy! Addictive ....addictive! After running into a few minor glitches getting the program to load and run I started on "relaxed" mode without instructions(Or warning I should say). I must admit, at first I hated it, everything was exploding and I had the devil of a time even seeing where the ball was going. When I got down to the last couple of bricks,it took forever to get rid of them. ARRGgggg! But I was determined to make it through that first level. Eight levels later I came up for air!! It was one of those,just one more level deals:)) By then I had figured out that on relaxed mode you have unlimited lives and to get through a level you had to use strategy. Use the bullets first to clear the lower blocks and the guided missiles to clear out the stragglers at the end, because even though you can use the paddle to hit the ball to where the blocks are, if they aren't turned right it won't connect. Save a few missles back for the end or it will take forever to finish the level. I then checked out the regular Arcade mode and the options menu. The development team seems to have tried to think of everything. It has windowed mode, but the game functioned poorly on this mode for me, perhaps with tweaking it would work better. Full screened, the options I chose worked fine. Laura #20, I don't know if this would help you, but you can turn off the movement of the background screen. This game is like a shooter-breakout-carnival ride, it does leave you a little dizzy, but in a fun way. The coins you collect actually have a purpose, you use them to purchase bonus items to be used in the next level. Even with the glitches(I started out with -4 lives on the first level, lost one ball and lost the game)I really like this game. The music changes often enough it doesn't get too annoying, the sound effects are pretty good... the one voice that says "Play ball" sounds rather demanding, but I got used to 'pushy guy' and didn't mind him after awhile. I really don't know what would make this game better other than fix the glitches and throw in some cotton candy!